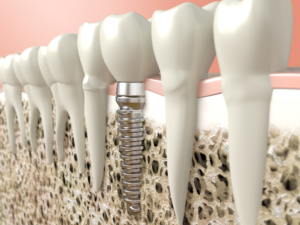 Can Dental Implants in Sunnyvale Stop Bone Loss? Although several advancements in dentistry over the last few decades have helped to decrease the rate of tooth loss, 120 million Americans are missing at least one tooth. When left untreated, it can lead to additional missing teeth in the future, difficulty speaking clearly, dietary restrictions, and confidence issues; however, there is another problem brewing beneath the surface. When you do not have all your teeth, your jawbone will begin to deteriorate. You can preserve its density with dental implants in Sunnyvale. Why Will I Lose Bone Density? Every tooth in your mouth plays a crucial role in your oral health. When even one is lost, the alveolar bone that surrounds and supports the teeth is no longer stimulated. As a result, the body determines that it is no longer necessary, so it begins to deteriorate. Although many believe this to be a slow process, you can lose as much as 25% of its width within the first year of losing a tooth. Over time, it will continue to decrease in height as well. As the remaining natural teeth lose support from decreased bone density, they develop a heighted risk for becoming loose and falling out. As more teeth are lost, the more your jawbone will deteriorate. Eventually, this will not just impact your oral health and quality of life, but your facial structures as well. Can I Stop Bone Loss? The only way to preserve your bone density after losing teeth is with dental implants. They are far different than any other type of dental prosthetic because they replace both the root and crown of the tooth. By surgically placing an implant post into your jawbone, it stimulates it to encourage new growth. This will restore its density while also providing a secure and stable foundation for the dental crown. With your jawbone fused to the post, it has the potential to remain in place forever. In fact, they have over a 95% success rate. Can I Get Dental Implants with Decreased Bone Density? If your tooth loss has gone untreated for a prolonged time, you may still be a candidate for dental implants; however, you may need a bone grafting procedure. This will improve the width of your jawbone to ensure that it is able to support the implant posts. If you have missing teeth, do not wait to have them replaced. Contact your dentist in Sunnyvale today to see if dental implants are the right solution for you. Dr. George T. Philip has provided complete dental care to the community since 2004. Supported by extensive training and qualifications, he offers more than just general dentistry. He also offers advanced services like dental implants. If you have missing teeth that need to be replaced, he can help. He will create a customized treatment plant to restore your smile. If you are ready to see if dental implants are right for you, contact our office today to schedule your consultation. Comments Off on Can Dental Implants in Sunnyvale Stop Bone Loss?